As much as I hate to admit it, we are in a battle. A fierce battle for our hearts, our families, our marriages, our thoughts, our churches and our lives. I will make this a little more personal and tell you that YES, I, too, am in a battle. My whole life has been a battlefield in my mind to FIX my eyes on JESUS and not the negative things happening in my life or in the world. It’s a battle I have lost time and time again, but as I’ve learned to be more intentional in this area and PRAY the Scriptures, God is giving me victory in my thought life. Slowly but surely. “The more we read God’s truths and let truth fill our minds, the less time we’ll spend contemplating untruths. Thinking runaway, worrisome thoughts is just an invitation to anxiety. However, my thought life isn’t the only place where the enemy is attacking. I think we can safely say that our HOMES are under great attack in the culture we live in as well. Our marriages, our children, and our homes are under attack like never before. Don’t forget, though, that our enemy is not flesh and blood. If we truly believe we are in a battle, what are the weapons we have available for our use? This is where it gets good, y’all. God KNEW we would have an enemy, He knew of the battles we would face and He has PROVIDED the very weapons HE KNOWS that we need. He always gives us what we need, yes? Sweet friends, WHY oh WHY do we not pick up these weapons every day? Why do we choose to NEGLECT the ARMOR God has given us?? I think, for some of us, we are in denial that we are in a battle. For others of us, we know what God has given us, but we don’t know HOW to use it. Maybe even others do not think we need to do anything on our own. 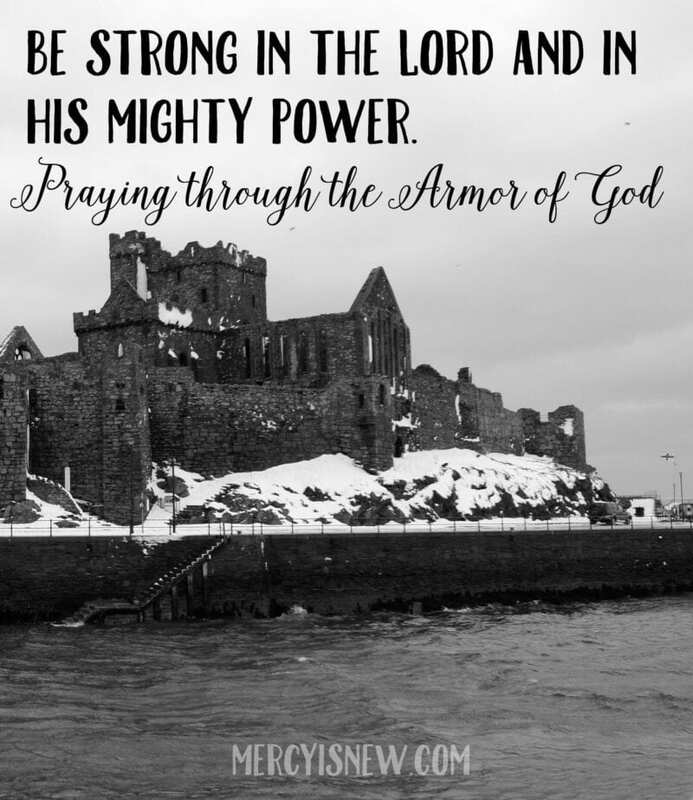 No matter what you believe about spiritual warfare, the truth of the matter is, God’s Word does not return void, His Word is TRUTH and He tells us we have an enemy and He even tells us He has given us this armor to utilize. That, right there, is enough for me. In Priscilla Shirer’s new book, Fervent: A Woman’s Battle Plan to Serious, Specific and Strategic Prayer , she gives us the strategies we need to fight this enemy where the battle needs to be fought: on our knees in diligent and fervent prayer. So, knowing we’ve been given this armor, let’s take a closer look at what this armor truly is. If you look closely at this list, you will see that some of these are things that GOD GIVES and some of these are things that GOD GROWS IN US. For instance, the Word of God is a gift God has given us, but faith is something that has to grow in us. Look over this list, dear one. What can you do TODAY to TAKE HOLD of the armor God has given us and engage in this battle? You see, if we continue to allow the enemy to do as he pleases, he begins to get strongholds in our hearts, lives and families. We cannot back down and we cannot DO NOTHING out of fear or because we claim we don’t have the knowledge of spiritual warfare. I’m encouraging you today, sweet friends, to put on your armor and WEAR IT. Belt of Truth – we are DESPERATE for a standard of truth in this culture today. You learn God’s truth, you read His Word, you memorize it, and you CLING to it. Not only that, but you STAND on His truth. Breastplate of Righteousness – means living right, reading the Word and learning the truth of God and then living it! Gospel of Peace – I venture to say we ALL know what life is like WITHOUT peace. How do we gain peace? It comes from a steadfast personal relationship with Jesus. Relationship means conversation and TIME together. Philippians 4:6-7 tells us to not be anxious about anything, but to take everything to God in PRAYER and THEN His peace will fill us up! More prayer = more peace. Shield of Faith – We all know that it is impossible to please God without faith. But, don’t be discouraged by that! Even faith as small as a mustard seed can move mountains, according to God’s Word!! Day after day, moment by moment, we can practice telling the Lord, “I trust you!” We can choose to speak aloud those words in moments of fear and by proclaiming our trust in God, He slowly but surely grows our faith! Helmet of Salvation – our salvation is completely a gift, given by the blood and sacrifice of Jesus, His life, His death and His resurrection. However, we must accept the gift. Our relationship with Jesus changes everything, salvation is the gift that keeps on giving. He is growing us and making us more and more like Himself! Sword of the Spirit – God’s Word – We cannot neglect this precious piece of armor, friends. We must pick it up, we must learn it, memorize it, meditate on it, speak it, shout it at the enemy if you must! For me, reading and studying and meditating on God’s Word are vital. And then, when I take it one step further and PRAY His Word, it continues sinking deeper into my heart, and that is exactly what I want! There is no legalism in this, you don’t have to do this to study God’s Word! I just love taking the very words of God and speaking them back to Him…asking Him to DO THOSE THINGS in me. You can read more about how and why I pray the Scriptures here. Lord Jesus, we come before you PRAISING You for who You are. You are Creator God. Faithful God. Awesome God. Trustworthy God. We give you all the glory because You alone are worthy. We confess that we have not utilized the armor You’ve given us like we should. We come to You, humbly asking for Your help. Help us to PICK UP this armor and PUT IT ON. Help us to wear the armor, Your truth, like a BANNER OF LOVE for the world to see. Remind us that we are most assuredly in a battle and You’ve given us these tools for a specific purpose. God, give us more of Your truth. May we stand firmly on Your Word and not bow to the lies of the enemy. Remind us of the truth that NOTHING can separate us from Your love. Lord, may we humbly walk in the righteousness of Jesus and know that He who is in us is GREATER than he who is in the world! Remind us that when You look at us, You see Jesus and the perfect righteousness of Christ. God, fill us with Your peace. The world steals our peace, but You give it freely. May we cling to You and Your ways and not become dismayed by what we see happening in the world around us. Increase our faith. Grow us. Stretch us. But, help us through each battle to proclaim our TRUST and FAITH in the God of the universe who is working all things for our good. Thank You for the gift of salvation. May we never forget the miracle that happened on the cross. Lead us back to the cross, time and time again…reminding us of the LOVE that Jesus had for You and for us. Remind us of the POWER of the cross and the POWER in the blood. Oh Lord, Your Word is precious to us. May we never take for granted this beautiful treasure You’ve given us. A love letter straight to our hearts. May we take hold and not let go. May we cling to the promises because You are faithful. May we be students of Your Word so that when the enemy draws his sword, we can fight with ours which is always VICTORIOUS.